Why opt to stay in a bed and breakfast rather than in a large hotel? The website http://www.bedandbreakfast.com/info/trav discusses the many reasons travelers opt for smaller, independent inns and bed and breakfasts. The article points out that hotels usually do not offer a big bang for your buck. The rooms can be small, you may pay for parking, and if there is a free breakfast it typically is a continental breakfast. Most amenities are available for an extra cost. 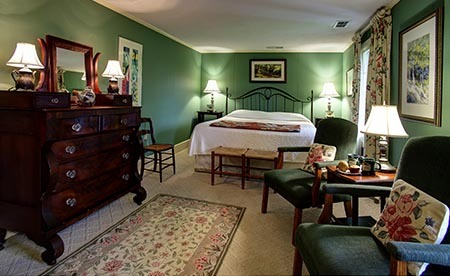 At the Buckhorn Inn, you get a comfortable room and free nearby parking. We offer complimentary Wi-Fi, which has been newly upgraded. One of the best perks about staying with us is the hearty and delicious breakfast that comes as part of your stay. You enjoy fresh fruit, juice, and fresh-baked biscuits and sweet breads while you contemplate your choice of entrée. 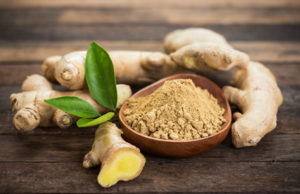 You may opt for a savory dish, like Country Eggs Benedict, a sweet dish like Bananas Foster French Toast, eggs cooked the way YOU like them with a breakfast meat, or a hearty bowl of oatmeal with delicious optional add-inns. And while you enjoy that, your mug will be kept filled with robust, regular or decaf coffee or tea. The Buckhorn Inn provides a serene oasis from the crowds viewing the eclipse. 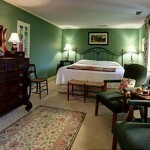 choose from several different traditional inn rooms, premier suites, cottages, or guest houses. Each has its own personality and décor. Many of our guests find their favorite and always try to book “Cottage 5” or “the Red Room”! Many B&Bs have rich history and stories. At the Buckhorn Inn, we are proud of our 80-year history of serving guests. We have tried to keep the original charm and feel of Douglas Bebb’s vision, while providing our guests with the most modern amenities. Innkeepers go the extra mile to make sure you feel comfortable and welcome. Innkeepers John and Lee Mellor provide personal attention and assistance to all their guests. The bed and breakfast staff are great local experts and can provide you with great advice on what to see and do in the Gatlinburg area. Part of that personal attention is providing fresh-baked treats in the afternoon and providing a library of good books and DVDs. Please let us know why you choose to stay at Buckhorn Inn! Need a winter get-away? While summer is the peak tourist season, our area offers plenty to see and do. When the leaves are down the views go on forever. seasonal weather also makes it a great time to visit Ober Gatlinburg. The resort has eight ski trails with varying levels of difficulty for beginners, intermediate, and experienced skiers and snow boarders. Certified instructors are available and an on-site shop rents skis and other equipment. The view from Anakeesta goes on for miles! Enjoy a meal or a snack, try your hand at zip-lining, or enjoy the treetop walk. 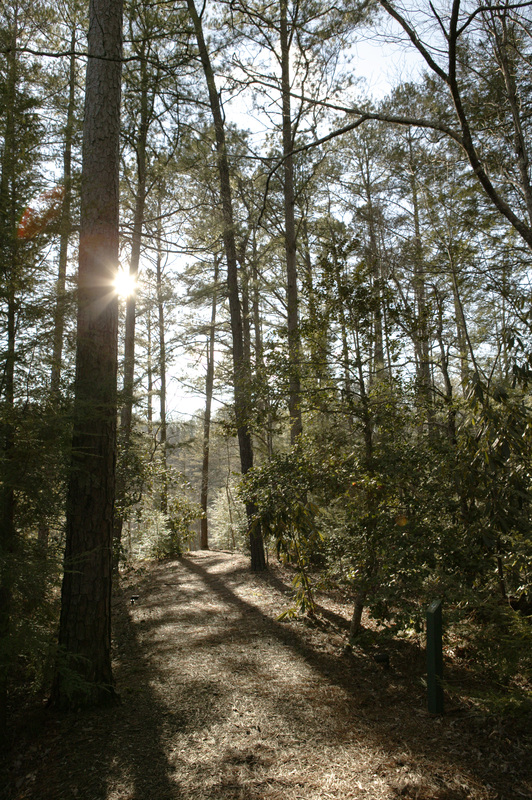 In this area about half the days in winter have high temperatures at more than 50 degrees F, making it very comfortable for hiking. Fewer tourists means more quiet. The absence of the leaves opens new vistas. It is easy to spot the stone walls, chimneys, foundations, and other reminders of past residents of the area. If there is snow on the ground, spotting and identifying animal tracks adds to the fun of your hike. If the weather has been below freezing for a length of time, you will see frozen waterfalls, sparkling icicles, and azure blue skies. Please note that as of today the federal government shutdown is still in force. That means that for most national parks there will be no park-provided services such as restrooms, trash collection, facilities, or road maintenance. For information go to the park website https://www.nps.gov/grsm/index.html. Before you start out, be sure to check the weather in the area you intend to hike. In addition to temperature and precipitation, wind is an important consideration. Limbs blowing down create danger. Our guests report that some of their favorite winter hiking trails are: Rainbow Falls, Porters Creek, Max Patch, and Andrews Bald. Please share some of your favorite hiking adventures! Get on Board the Buckhorn Inn Belle! Are you familiar with the Buckhorn Inn Belle? For New Year’s Eve 2018 we will transform the Buckhorn Inn dining room into a Mississippi River steamboat gambling salon. We look forward to welcoming our guests to our celebration of the year that was and the year that will be aboard the Buckhorn Inn Belle! As we cruise down the Mississip, we promise not to make any bights in the bend too sharply and no gentlemen will be asked to back-and-belly any heavy freight. Festive attire is encouraged for this night to remember. Our own Sharon Mellor will be in the pilot house for the evening. The evening will begin at 6:00 pm with champagne, hors d’oeuvres and Ragtime and Dixieland piano. Our house gambler, Two-Eyed Jack, will be on hand to deal you a hand of poker for prizes to both winners and losers. Dinner, presented by Chef Frank Downs, will be served at 7:00 p.m.
During dinner, watch out for any card sharps who may try sleight of hand at your table–we understand rounders may be about. And remember that all Gamblers and Fancy Women must register with the captain before the steamboat leaves the dock! 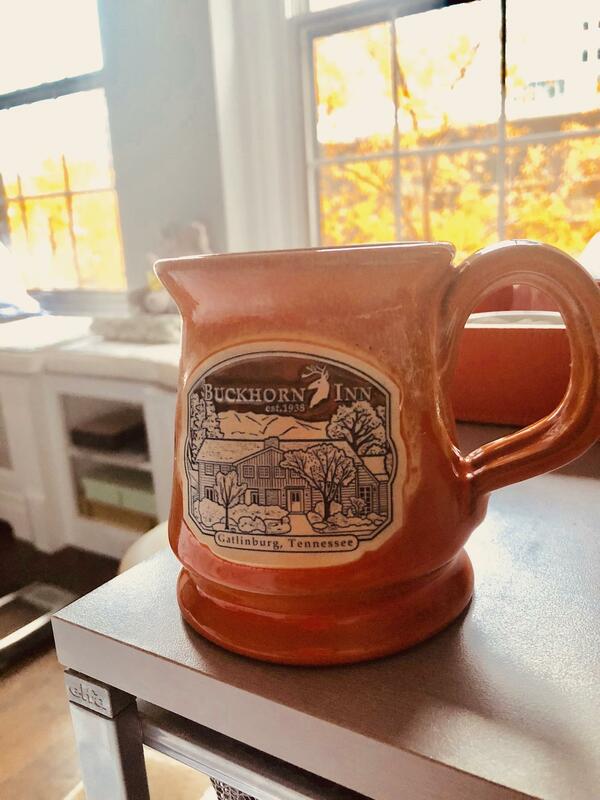 This cool and crisp weather makes it the perfect time to fill your Buckhorn Inn mugs with a warm beverage. Coffee and hot tea are good ways to start the day but we have some other ideas to warm your hands and heart. 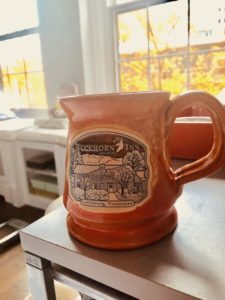 Our orange Buckhorn Inn mugs are quite popular with guests. This “from scratch” recipe makes a superb hot chocolate. Melt chocolate with water over direct heat, stirring constantly. When creamy and smooth add sugar and salt. Return to heat and cook four minutes longer. Slowly add milk and heat until chocolate mixture and milk are well-blended and hot throughout. Pour into mugs, top with whipped cream, and garnish with cinnamon and/or chocolate sprinkles. Fills four large mugs. Served with a dash of nutmeg, mulled cider is wonderful to wake-up to on a chilly morning. Tie the whole spices in a cheesecloth bag. Heat the cider and sugar. 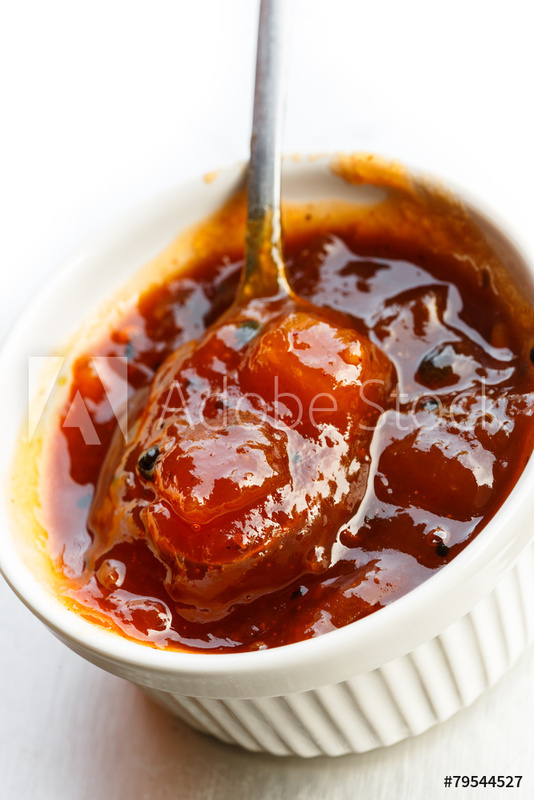 Drop in the spice bag and let simmer until the cider is fragrant and spicy to your taste. Top each serving with a sprinkle of nutmeg and a curl of orange peel. 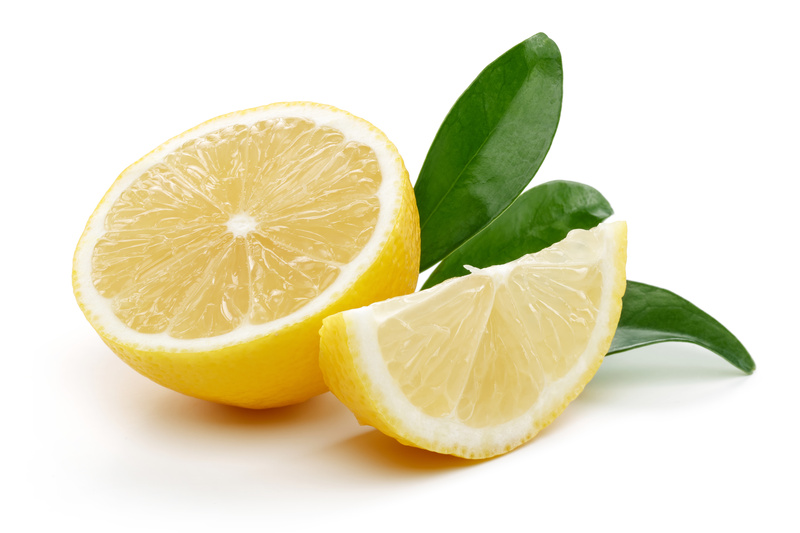 This recipe is also refreshing served chilled during warm weather. This easy recipe comes to us from Real Simple magazine http://www.realsimple.com/food-recipes. Combine the cranberry juice cocktail, sugar, cinnamon sticks, and star anise. Simmer for 15 minutes. Stir in the wine and cranberries and bring back to a simmer. Serve warm with a few cranberries in each mug. These are some of our favorites, but we would love to hear yours. 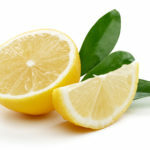 Please feel free to send us your warm-up recipes and we will share them on this blog. 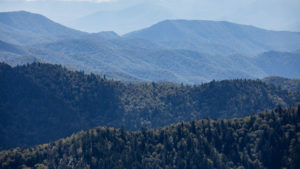 Today’s guest blogger http://www.trip101.com shares five of the best activities to enjoy in the Great Smoky Mountains. Perhaps the most renowned mountain range in North America, the Great Smoky Mountains border North Carolina and parts of Tennessee, and offer a virtually unlimited selection of world class outdoor activities. Opportunities abound across the “Smokies,” an iconic portion of the Appalachian Mountains, where diversified forest ecosystems thrive among untouched and protected spaces alike. From spruce-fir forests to river valleys, the Great Smoky Mountains offers a proven solution for outdoor adventure in the American southeast. Check out our top five activities worth pursuing in the Smoky Mountains, to fill your travel itinerary with easy, lifelong memories. The observation deck of Clingman’s Dome in the Great Smoky Mountains. panoramas of the surrounding landscapes, together with a simply unmatched sense of accomplishment. Clingmans Dome is halfway in North Carolina and halfway in Tennessee, and provides hours of hiking enjoyment to dedicated travelers. Drive Clingmans Dome Road, and then take to a rather steep pathway up to the summit itself, fitted with an observation tower for extended viewing enjoyment. 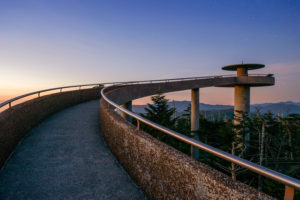 When visibility is at its best from the top of Clingmans Dome, you can see for more than one hundred miles in all directions, and into seven individual states. Take in a picture-perfect sunrise or sunset from the peak, and cross-country ski to the destination come wintertime. Located in Tennessee, well within the confines of the Great Smoky Mountains National Park, Cades Cove qualifies as a staple site in the southeastern portion of the United States. The original home to decades-old settlers, Cades Cove is today beloved for its easy access and scenic wildlife surroundings. The historical element of the site alone is enough to satisfy qualifications for the National Register of Historic Places. A geological “limestone window” defined by dated erosion, Cades Cove is home to rock formations that are more than 400 million years old. Take note of the fact that you must plan ahead if you plan on visiting Cades Cove, given the fact that it is the single-most visited location within the confines of the National Park itself. Home to Cherokee natives, European settlers and now generations of satisfied travelers, Cades Cove offers the unique synthesis of panoramic landscapes and educational immersion alike. Mt. LeConte offers spectacular views. mountain are easily 450 million years old, if not more. Annual snowfall at Mount Le Conte totals nearly forty inches per year, so if you plan on visiting this site during the winter you would be advised to dress accordingly. Interestingly, Mount Le Conte is also renowned for its lodge near the summit itself, so if you’re looking for some award-winning hospitality along your way to the mountain’s peak, that’s an opportunity worth pursuing. If you spot a train of llamas trekking alongside of you, don’t be alarmed: llamas deliver supplies to the lodge three times a week during peak operational months. Intermediate hiking conditions and frequent opportunities for photos make the hike up Mount Le Conte worth every second of your investment. From the bottom of the mountain to the summit, you can expect an elevation gain of nearly 900 feet, coupled with lasting opportunities for photos and fresh, outdoor air alike. 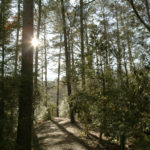 If you’re looking to reach Andrews Bald, you’re going to want to embark on the nearby Forney Ridge Trail, which eventually delivers you to your destination. Well-maintained hiking endeavors and stone steps pave the way to the summit itself, part of a park-wide manicured effort to keep this location easily accessible to all guests. Andrews Bald is the destination for you if you’re looking to bring the entire family along for the ride. Again, this hike is an all-time favorite among dedicated Smoky Mountains hikers, so you’re going to want to get an early start, and prepare to accommodate other hikers en route to Andrews Bald itself. All in all, the hike’s popularity witnesses to its worth, as a family-friendly, worthwhile endeavor in the Great Smoky Mountains. With a name like Roaring Fork, you know the experience is worth your investment. 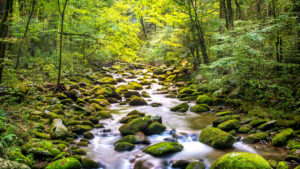 A stream that cuts through the Great Smoky Mountains in the Volunteer State, Roaring Fork today is the home of both a historic district and a nature trail of the same name. Straight from the Little Pigeon River, the Roaring Fork stream is a must-see in the Great Smoky Mountains. Take the trail direct to the stream, along the way experiencing waterfall background, ample opportunities for relaxation and the chance to take life at a pace comfortable for you. 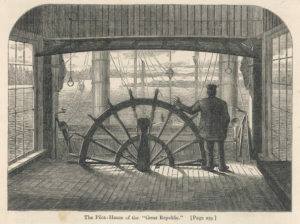 Activities include touring historic sites. Historically preserved cabins, mills and more will greet satisfied hikers upon arrival, making Roaring Fork an ideal outing, especially for those individuals looking for a quick immersion into local lore. By popular demand, we are posting the recipe for our soft, sweet, and spicy ginger cookies. We find the rich, warm tastes to be perfect for fall. Ginger and spice make these cookies nice! tournament. Queen Elizabeth I is given credit for popularizing fancily decorated ginger cookies and they came to symbolize all that was elegant in England. http://time.com/4602913/gingerbread-men-history The colonists brought ginger baked goods to the New World. Early Americans appear to have preferred softer gingerbread and the first American cookbook contains three different recipes. The Marquis de Lafayette was partial to the soft gingerbread served to him by George Washington’s mother. Buckhorn Inn’s soft ginger cookies offer a delicious taste of history. Preheat oven to 350 degrees. Cream butter, sugar, and egg until light and fluffy. Then mix in molasses, corn syrup and milk. Add flour, baking soda, cinnamon, ginger, and cloves, creating a stiff dough. Pinch off small pieces of dough and shape into 1 1/2″ balls. Roll in sugar. Place 3 inches apart on ungreased baking sheets. Bake 11 to 12 minutes until tops are puffed. Cool cookies 2 minutes on baking sheets, then remove to racks to cool. These freeze well. The recipe makes about 40 cookies. The City of Gatlinburg is celebrating autumn and the harvest September 7 through November 25, 2018 with the Smoky Mountain Harvest Festival. This is a fabulous time of year to visit Eastern Tennessee. You can enjoy the beautiful fall colors, visit talented artists and craftsmen, enjoy the whimsical decorations, or take in one of the area’s special events. Many of our guests have marked their calendars for the November 8 Chili Cookoff. More information on this and other events is available at https://www.gatlinburg.com/event. Gatlinburg is embracing the season with brand-new autumn-themed displays, life-size scarecrow people, and scarecrows created by individual business establishments. Scarecrows are used by farmers to protect their crops from birds. Historians tell use that people the world over have used scarecrows for more than 3,000 years. The first record of scarecrows is by the Egyptians who used them to protect their wheat fields along the Nile. Each culture designed their scarecrows differently. Greek scarecrows looked like one of their gods, while German scarecrows are distinctly witch-like. Gatlinburg is celebrating the season with whimsical scarecrows. 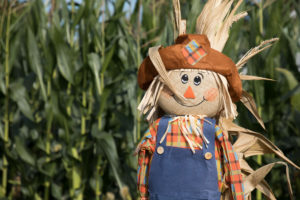 Most scarecrows in the U.S. are human in form and dressed in old clothes. Some farmers use aluminum strips tied to the scarecrow to catch the light and scare away birds. Inflateable tube men have also been used in this fashion. The scarecrow has been a powerful symbol in literature. Nathanial Hawthorne’s short story “Feathertop” features a scarecrow brought to life by a witch in Salem, Massachusetts. Whether you prefer Ray Bolger’s scarecrow in “The Wizard of Oz” or Michael Jackson’s in “The Wiz”, we all root for the scarecrow who bemoans “If I only had a brain . . .”. And Indiana-born John Mellencamp featured the agricultural anthem “Rain on the Scarecrow” in his 1985 album “Scarecrow”. Some of the most colorful names for scarecrows come from the United Kingdom. There the figure may be called hay-man, murmet, hodmedod, tattie bogle, mommet or mawkin. 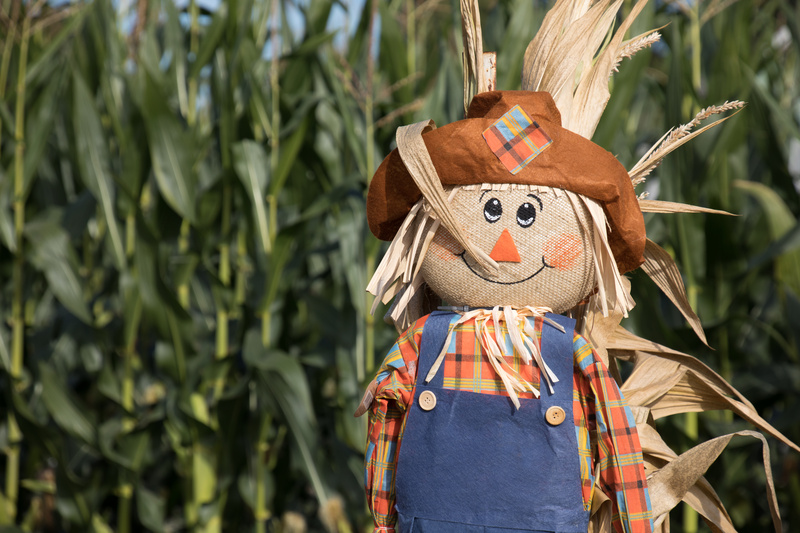 By whatever name, we find scarecrows to be the iconic decoration of the harvest season! In 2018 Buckhorn Inn is celebrating our 80th anniversary with Throwback Thursday! Each Thursday in August our talented chef, Matthew Poole, will incorporate into the menu his modern take on some historical recipes. 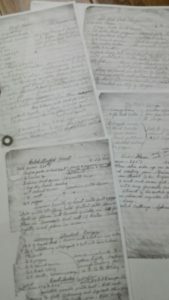 Innkeeper Lee Mellor is in possession of the original hand-written recipes used by our cooks in the 1930’s! 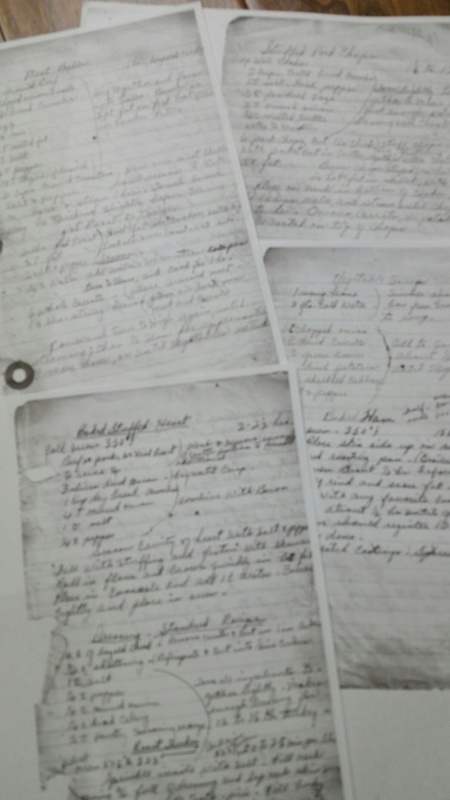 These handwritten recipes served the Buckhorn Inn kitchen well in 1938! Desserts figured prominently in these early recipes. We found recipes for Fluffy Banana Cake, Texas Pecan Pralines, and Heavenly “Goo” topping for shortcake. Savory recipes from 1938 include stuffed pork chops, roasted turkey and porcupine meatballs. Don’t worry– there is no porcupine meat in these meatballs! The name comes from the way rice grains poke out of the meatballs when they are done. The rice resembles the quills of these little animals, common in Israel. In Hebrew these meatballs are called Ktzizot Kipod. The Buckhorn Inn opened its doors for business in August 1938. Many Knoxville residents visited this new Inn for lunch. Yes–in those days the Inn served three meals a day. Leisurely, plentiful lunches were a hallmark of the times. Douglas Bebb was passionate about the meals served at the Inn. He raised his own chickens to provide the very freshest eggs and his garden produced an abundance of fresh vegetables. He was an excellent cook and prepared all the meat dishes served at the Inn. 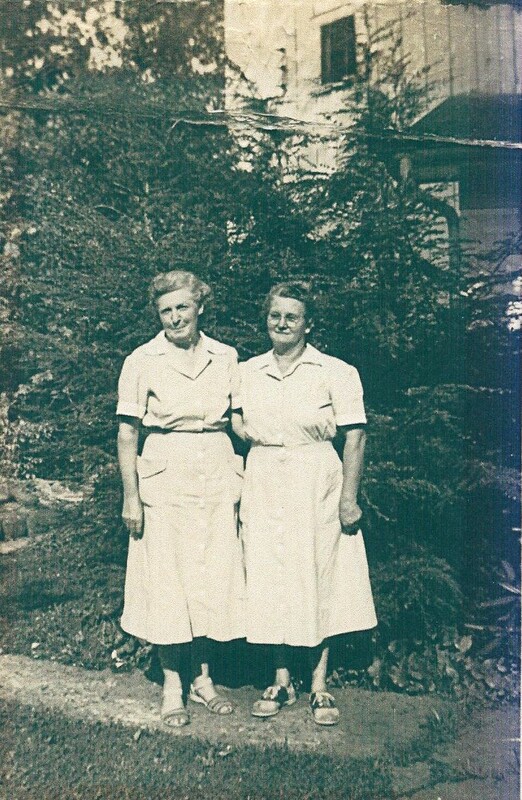 The ladies pictured here are Buckhorn Inn staff members Ella Huskey and Grace Price Branam (on the right). Mrs. Branam was the original cook for Buckhorn Inn. The guests especially looked forward to the Sunday luncheon buffet. It was Mrs. Branam’s (the cook) day off, so Mr. Bebb cooked the meal in its entirety. He was rightfully famous for his corn pudding. In fact, his recipe was featured in the book Ford Times published by the Ford Motor Company to encourage driving vacations. In those early days, a staff of four served the three meals a day. Tennessee was dry in those days, yet the pre-dinner cocktail hour was an honored tradition. The guests would simply bring their wine and spirits with them. Ellen Bebb, daughter of Douglas, reports that some of the guests would take turns hosting cocktail hours in the cottages. But the greatest honor was bestowed when guests were invited to Bebb House to share cocktails with their hosts. Join us for a taste of history during dinners this August. Visit our website http://www.buckhorninn.com/dining/weekly-dining-menu to review our upcoming menus.